DesignBoom.com: At the EMPA and EAWAG NEST building in Dübendorf, eight ETH Zurich professors are collaborating on a three-storey DFAB HOUSE made using predominantly digital processes. Built using a two-meter high construction robot, the machine works by moving autonomously on caterpillar tracks. 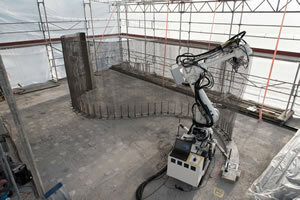 A steel wire mesh fabricated by the robot serves both as formwork and as reinforcement for the concrete. Thanks to the dense structure of the steel wire mesh and the special composition of the concrete mix, the concrete stays inside the grid and does not pour out. The result is a double-curved, load-bearing wall that will characterize the architecture of the open-plan living and working area on the ground floor. A smart slab will then be installed – a statically optimized and functionally integrated ceiling slab, the formwork of which was manufactured using a large-scale 3D sand printer.